Last week, the Press Democrat reported on a fire that consumed a quarter-acre grass lot in Santa Rosa, a blaze investigators blame on a tossed cigarette. The fire occurred shortly before 7 P.M. on Tuesday September 8 near Santa Rosa Avenue and East Robles Avenue. Thankfully, firefighters quickly gained control, stopping flames just 50 feet from a business. Police report that a 36-year-old Santa Rosa woman admitted to tossing a cigarette into the grass. She said she thought the cigarette had been extinguished. When the grass caught aflame, she and a companion tried unsuccessfully to douse the fire. Police stopped the woman as she began to leave the scene. She was arrested on suspicion of starting a fire and an alcohol-related probation violation and held on $10,000 bail. Unfortunately, cigarette fires are far from unusual and often result in greater tragedy than burnt grass. In July 2013, the National Fire Protection Association (“NFPA”) released a study entitled “The Smoking-Material Fire Problem.” Per the report, U.S. fire departments responded to some 90,000 smoking-material fires in 2011, a figure little changed from the 90,800 smoking-material fires the year before. 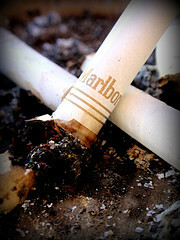 The 2011 cigarette fires are blamed for 540 civilian deaths, a substantial drop from 610 civilian smoking-fire deaths in 2010. Additionally, the report says that smoking-related fires injured 1,640 civilians in 2011 and caused $621 million in direct property damage. The good news: there has been a “long-term trend” of fewer and fewer smoking-material fires. Table1b shows a marked decline in civilian deaths in smoking-related fires from 1,950 in 1980 and 2,210 in 1981 to the 540 in 2011. The NFPA’s report attributes the drop to a decreased number of smokers, regulations requiring mattresses and other furniture be increasingly resistant to cigarette ignition, and nationwide rules mandating cigarettes be “fire-safe” (i.e. reduced ignition strength making them less likely to start a fire). We are heartened by these trends, but remain concerned about those who continue to be injured and killed because of smoking-material fires. Each injury, each death, is one too many. Notably, the report finds one-quarter of those killed in smoking-material fires were not the person who smoked the at-issue cigarette and nearly half (46%) of those who died in home smoking-material fires were aged 65 or older. The latter figure is particularly concerning given that people 65 and older comprise only 13% of the population and older people are less likely to smoke than younger individuals. What should you do if you are injured or lose a close family member in a smoking-material fire? First, obtain any needed medical treatment. Next, contact legal counsel as soon as possible to avoid the loss of physical evidence, problems with fading memories, and time limits on filing claims. In addition to potential claims against the person who improperly disposed of the materials, other claims may exist such as claims against a cigarette manufacturer that did not comply with fire safety requirements, landlord/tenant claims if the injury occurred in a rental property that lacked appropriate fire safety equipment, product safety claims related to mattress/furniture flammability, and/or claims against others whose negligence contributed to the fire and/or your injuries. Attorney Brod serves as a fire injury lawyer in Santa Rosa and throughout Northern California. Independently and in conjunction with experts, he thoroughly investigates each case to determine all potential legal claims. Call to arrange a personal consultation.